"I cannot order better white clam sauce in a restaurant. My boyfriend begs me to make this! Thanks Mom! Serve this dish with fresh garlic bread and a nice white wine. I promise this is a keeper and you won't like any other white clam sauce!" Bring a large pot of salted water to a boil, add linguini and return water to a boil. Let linguini cook until al dente; drain well. In a large skillet, saute the onion and garlic in olive oil until the onions are translucent. Drain the cans of minced clams, reserving half of the juice. Stir the clams, reserved juice, butter, salt and pepper, and wine. Simmer the mixture for 20 minutes, until the sauce has reduced 1/3 and has thickened. 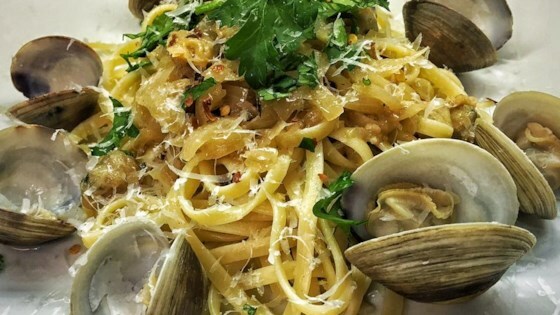 Spoon the clam sauce over the linguini and serve. Incredible! I added mushrooms as was suggested in some of the other reviews and I waited until the end to add the clams and simmered them for just about 1-2 minutes, I didn't want chewy clams. This sauce is almost as good as restaraunt sauce. I found it is best to increase the wine and garlic and decrease the butter. I also added fresh basil--that really jazzed it up.